Half a glance at Jess Joy and Andrew Martin would be enough for a reasonably astute mind to assess that there’s something fantastically unique about them, even if only musically speaking. 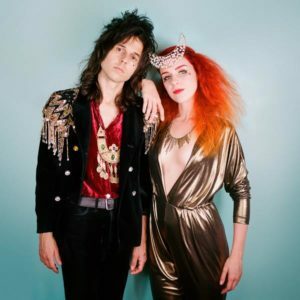 As the Los Angeles-based duo Moon Honey, between Joy’s supreme soprano and Martin’s glam-laced guitar worship, the two conjure and divine a surrealistic pillow of sound: equal parts psychedelic rock and pixie dust. It makes sense that Louisiana bore them, even more sense that LA now nurtures them where they have found a home along with a steadily growing fanbase amidst those as richly eclectic and artistic as they are. See their wonderfully weird video for their latest release, “Betta Fish,” for further.